Wicked Good Chicken is like a grownup version of honey mustard chicken, no mayo required. This quick-prep meal is a friend on a busy night and the leftovers can be enjoyed in so many ways. 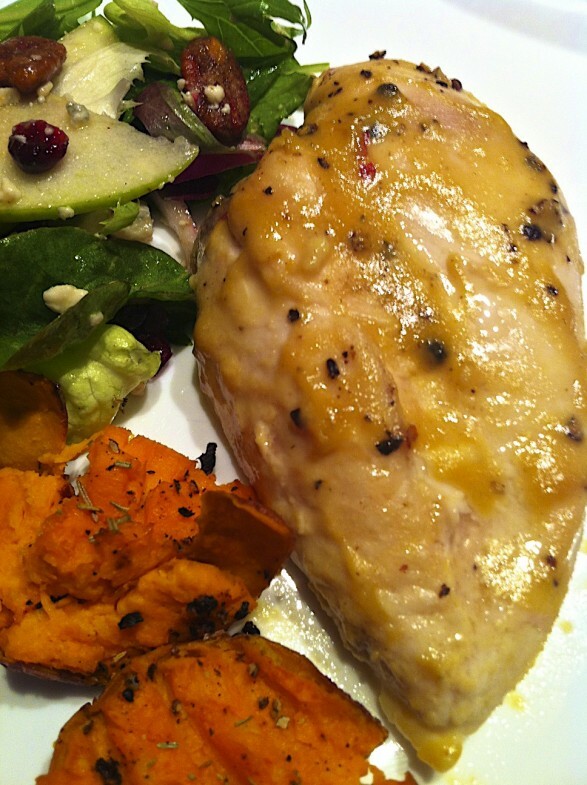 The only thing to say about this chicken is that you really must try it! It’s incredibly easy to prepare and will satisfy with its punchy flavor－after you’ve enjoyed a delightful aroma wafting from your kitchen. Without a doubt, this is a go-to weeknight recipe. Years ago, I polled my family for a good name for this dish, as a mere mention of the key ingredients just didn’t seem to do it justice. It deserved more. For a fabulous round-two dinner that’s light yet satisfying and brimming with flavor, slice leftovers and place atop a plateful of Apple Pecan Spring Greens with Honey Dijon Vinaigrette. Lately, I’ve been serving Wicked Good Chicken with Fall Slaw and forbidden rice. (Also known as black rice, it’s a new favorite; brown or wild rice complement nicely, too.) The mixers among us cut the chicken into pieces and eat it all together, bowl style. Looking for an easy meal to bring to someone who’s sick, recently had a baby or is recovering from surgery? 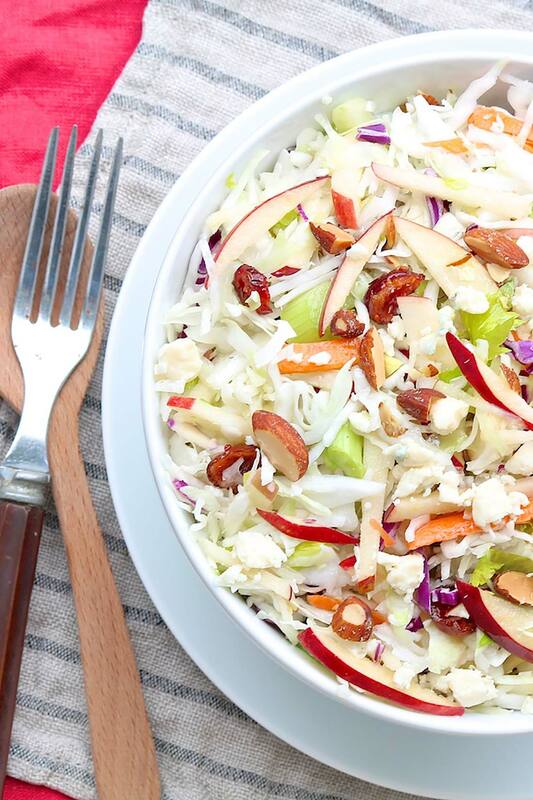 I’ve delivered the chicken, Fall Slaw ⇩⇩ and rice combination several times recently. It’s a nice variation from the pasta dishes that are often received, and ideal when someone is trying to eat healthy without sacrificing flavor. The meal is easy to double or cut in half, too. Wicked Good Chicken is like a grownup version of honey mustard chicken, no mayo required. It preps quickly on a busy night and leftovers can be enjoyed in so many ways. Mix Dijon, maple syrup, and vinegar together in a medium-size bowl. (Prep-ahead tip: Dijon mixture may be made a day or two in advance, covered and refrigerated.) 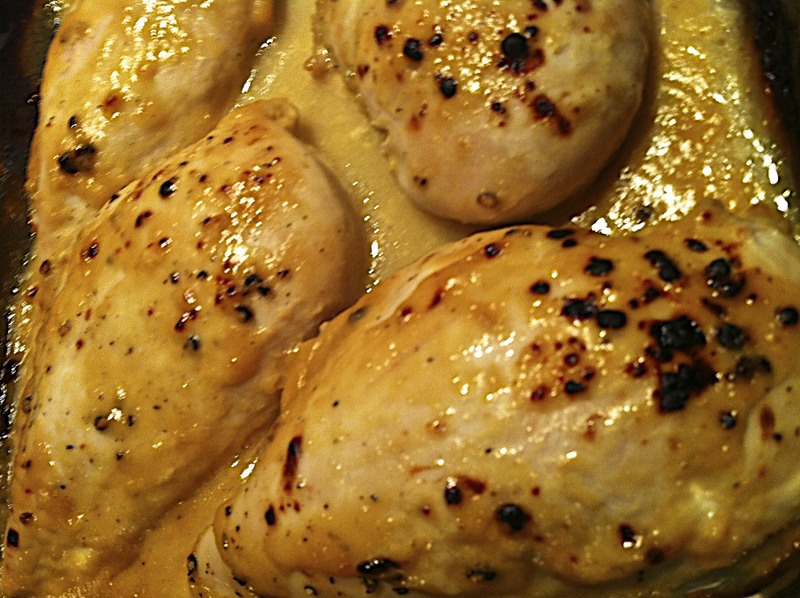 Place chicken in a 9×13 baking dish (I don’t grease, but it wouldn’t hurt) and pour the mustard mixture over the top. Flip chicken so that it’s fully coated with sauce. Sprinkle lightly with salt and pepper, as well as a little rosemary, if using. Bake in oven preheated to 450℉ for about 17 to 20 minutes, depending on size of chicken breasts, or until chicken is just cooked through and the internal temperature when taken with a quick-read thermometer reads 165℉. Half way through cooking time, spoon some of the sauce from the baking dish over chicken. Allow chicken to rest for five minutes before serving. •The mustard mixture is bright and tangy; those who prefer a sweeter dish may add an extra tablespoon or so of honey or maple syrup. •A little rosemary goes a long way. When using dried rosemary, I use about a teaspoon, lightly crushed. When using fresh, I add 1/2 teaspoon, minced, and garnish with an extra sprig or two. For the accompanying recipe for Smashed Roasted Potatoes, click here. Just found this and think I will make tonight with the chicken tenders I have thawed. I think it will go well with the butternut squash bake I am making. It is easy and I just happen to have all these ingredients on hand! Wicked awesome chicken! My children told me that this meal was the best dinner I have ever made! Love Fountain Kitchen ‘s recipes! You just made my day, Jennifer! Thanks for the terrific feedback! I do a version of this using low fat honey mustard salad dressing. Going to try this with boneless pork loin chops I have! Going to make this tonight! ! Thanks! We loved every last spoonful of this. Served with a side of cauliflower. Amazing! Made this last night for dinner. Next time, I’ll need to make a double batch as this was a huge hit! The sauce is so flavorful anything could go along side. I did make spaghetti squash along with this and added some grape tomatoes, black olives, shaved parmesan and some greek marinade/dressing. I’d like to try this with chicken thighs! I sent this recipes to several of my girlfriends because it is so simmple to make it’s ridiculous and it tastes so good! Your spaghetti squash side dish sounds like a perfect accompaniment for this chicken recipe, Judy. I am thrilled this was a hit and hope your girlfriends enjoy it, too! My husband and I had the WIcked Good Chicken for dinner tonight….we liked it very much….easy to prepare, I will have this recipe again..
I’m so glad you enjoyed this, Sue, and appreciate your thoughtful comment!